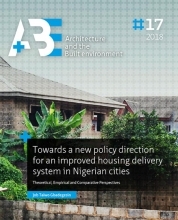 In Nigeria, housing units are not adequate for the entire population, especially in cities (Anosike et al. 2011, Makinde 2014). For instance, the deficit grows at an alarming rate, from about 8 million in 1991 to over 16 million in 2000s (Aribigbola, 2000; Aribigbola and Ayeniyo 2012). The challenges of housing provision are not only quantitative but also qualitative and have to be dealt with in a dual institutional perspective: the formal and the informal sector (Makinde, 2014; National Population Census, NPC, 2006). How can the Nigerian housing provision be improved and what are the new roles that policy can play to address the housing shortages in Nigerian cities? Several researchers have examined the subject of housing in Nigeria and confirmed the existence of shortages. Some have also attempted to advocate that there are challenges without giving an appropriate policy way forward. Also, most of the existing studies are not based on appropriate theoretical underpinnings. Therefore, this thesis contains a diagnosis of the housing problems in Nigeria, based on the nature of the housing provision systems (formal and informal) and a framework for possible policy solution(s), using theoretical, empirical and comparative approaches. Emphasis was placed on the theoretical and empirical perspectives, while an insight was gained into possible solutions adopted in some selected countries through a synthesis of extant studies. To capture the actual contexts of housing challenges, six objectives raised in the form of research questions were pursued. In the first objective, the Nigerian housing situations were examined in the contexts of political, economic and demographic developments in order to identify the nature of the housing shortages. Findings from the first objective indicated that housing shortages in Nigerian cities are both quantitative and qualitative in nature. The major problems were found in the informal sector because the formal sector is not accessible due to changes in government administration, the low income condition and institutional barriers. It was found that the decline in the formal provision resulted in the growth of the informal provision.